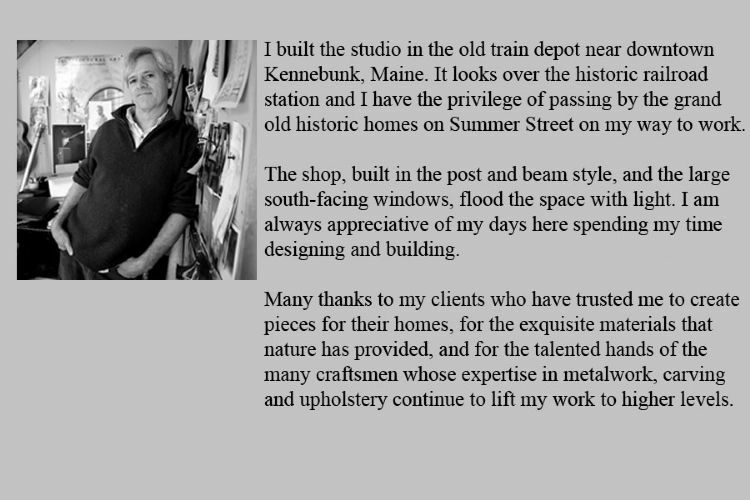 I built the studio in 1984 in the old train depot near downtown Kennebunk, ME. It looks over the historic railroad station, and I have the privilege of passing by the grand old historic homes on Summer St. on my way to work. I built the shop in the post and beam style, and the large south-facing windows flood the space with light. I am always appreciative of my days here spending my time designing and building. Many thanks to my clients who have trusted me to create pieces for their homes, for the exquisite materials that nature has provided and for the talented hands of many craftsmen whose expertise in metalwork and upholstery continue to lift my work to higher levels.